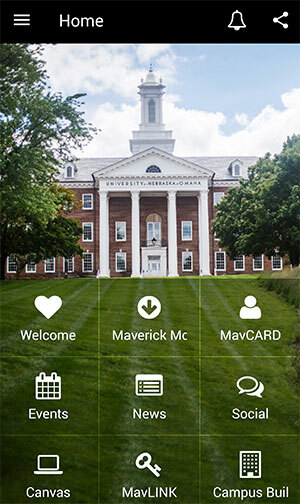 The UNOmaha app brings all things Maverick into one easy location for your mobile device. Get the latest news, find a building or class, access discounts, and so much more. One place. At your fingertips. With the UNOmaha mobile app. UNO is transitioning to Canvas starting with the Summer 2017 semester. By Summer 2018, all courses will be in Canvas. Students, please talk with your instructors to see if they are using Canvas or Blackboard. Gmail and Google apps for education. Note for student users: In order to set up gMAV on your phone or mobile device you must use a mobile password which is different from your regular gMAV password. Learn more about gMAV or set up your mobile password. UNO Shuttle Tracker lets you view and track the bus in real time. Search for a stop near you, view the estimated time of arrival, and set reminders so you never miss the bus. Add push notification to receive important announcements and updates about route changes. The BCycle app lets you use bike share for transportation, play, fitness, and more by allowing you to explore your community or new city in a way that is fun and convenient with useful information right at your fingertips. Only on campus for a short time each week or semester? Save money by purchasing a daily or hourly virtual permit, instead of a semester or annual permit. Both the Pacific Street Garage and West Parking Garage will be open for hourly and daily parking. Pay-to-park by the hour with the Park Omaha app or new kiosks in both garages. ParkOmaha app users will find lot zone numbers clearly posted at eligible parking sites. The official app for University of Nebraska at Omaha IM sports and Fitness Programs. Stay up to date with UNO Campus Recreation programs by downloading our mobile app! This self-guided tour will give you a chance to explore campus and provide you with a preview of what the Maverick Experience has to offer, whether you're here in person or miles away. The UNOmaha Mobile App is the official app at the University of Nebraska Omaha. Find out more about future phases and how to request enhancements.